Feeling like you're the last true conservative left in Justin Trudeau's Canada? 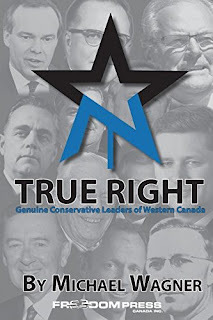 Then you need to read Michael Wagner's True Right and find out that all through Canada's history great, solid, courageous conservative men have stood up to the socialist hordes. I've worked with Michael Wagner on the magazine Reformed Perspective, for years now, and always enjoyed his articles, so I knew this was going to be good. He set himself the ambitious task of laying out what makes a true conservative conservative, and took his inspiration from a long-time leader in Western Canada, the writer, editor and all around troublemaker (in the best possible sense), Ted Byfield. So what then is a true conservative? Someone who knows who God really is, and knows the government ain't Him. And what exactly is in the book? It's divided into 17 short biographies of political leaders who shaped Western Canada. Wagner explains why some were true conservatives and some weren't. There's controversy to be had in the "weren't" camp, where the author places some big and well-loved names...but his reasoning is hard to argue with. Among the 13 "were"s most readers will find a pleasant surprise or two, meeting stalwart gentlemen who they'd not previously known. What an encouragement to hear that we’re not alone! Yes, even in Canada there have always been true conservatives, good and godly men, who were willing to stand up and fight, win or lose. You might differ with Wagner on some of his assessments – I think in noting these men's strengths, he's sometimes overlooked a notable shortcoming or two – but you'll most certainly come away encouraged. True conservatives are a rarity in Canada, but as Wagner shows, there have been some who have fought big battles and, win or lose, have remained true to God. You can pick up a copy in Canada at Amazon.ca or, in the US, at Amazon.com.